As a caring and responsible pet owner, you know that, inevitably, you are going to transport your dear companion at some point in your life – to a vet, to a brand new home (think more of a journey in the skies), or elsewhere. There are a lot of times when dog crates come as a great aid when transporting your pet. However, did you know that this voyage can be rather stressful to your four-legged friend, and, for that and other reasons, can cause you worries likewise? As veterinary experts, we’ve emphasized how stress affects pet’s health in various articles before, and this is another case where such precautions should be considered as the topic today has a direct relation to that. Why is a cover for dog crate necessary? 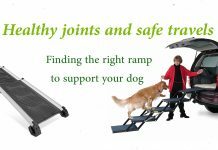 To supplement the aforementioned arguments regards your dog’s health, we are certain you must understand that it’s also important for your dog to feel safe and have its own personal space (something we also emphasized in various articles, including the informative buyer’s guideline article on dog beds). Safe spot. A sense of safe den that is its own with no intruders. Mimicking this type of shelters make something similar to what dog predecessors, wolves, had – these ground shelters are low and narrow enough, yet, with just sufficient room, for this carnivore to enter and exit. The instinct to seek a quiet and cool, in other words, safe space flows strong in dog’s genes. Personal space. Goes hand in hand with the previous point. Opportunity to relax – both for dog and the owner. When a crate is uncovered, your dog gets distracted by everything that’s moving around. Your four-legged friend gets jumpy, playful, or even aggressive, disturbing and stressing out not only itself but you, the owner, too. Minimize your headache by giving a slightly more relaxed environment to your pal – give it a chance to sleep and restore its vigor to the right activities at the right time. These are the main reasons for a dog crate cover. When going on a hunt or a big camping trip, you should look for an insulated dog crate cover. This type of dog crate cover protects from frigid temperatures when setting up for such ventures. How to choose the best solution in your case? Most (commercial) dog crates conform to standard measurements. That way, it’s much easier to find an appropriate cover. If you choose a custom-made or a specific/designer dog crate, you have to look more carefully to match the crate with the cover – always check the measurements and design carefully in such cases. However, if you need a dog crate only for indoors and do not plan to transport it frequently, we actually advise you take a look at wood-design dog crates that look more appealing and may fit much better with your house interior. Most of these crates sort of already have a wooden cover, therefore, you may manage without additional crate cover. A good example could be Casual Home 600-24 Pet Crate. For other (transporting, for the most part) purposes, please take a look at the following list of the best dog crate covers. Afterwards, we’ll talk about hunting dog crate covers and camping dog crate covers specifically. If you are looking for quality combined with universal use, this might be the best choice for you. As the name implies, Precision Pet Indoor/Outdoor Crate Cover is usable both indoors and outdoors, and is great for transportation – both short and long distances. We also appreciate the variety of sizes available – you can choose from 6 different options that should fit perfectly with all the standard dog crate sizes. Whatever size you choose, it gives you a variety in terms of lightening too – from complete darkness when all windows are closed to an adjustable view, ventilation, and visibility when opened. Additionally, it has a zipper closure and a top flap so you can easily carry the crate by the top handle. We’d also like to point out this cover for dog crates is machine washable. Furthermore, the material used in this product is heavy duty canvas/nylon, meaning, it is water-resistant (therefore, suitable for outdoors). Overall, we truly appreciate the effort that has gone into production of this one; The one drawback, however, might be that the material, especially, the side windows can get ripped off after a while if not used discreetly. 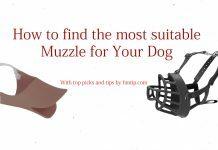 HM tip: Consider this one of the very best dog create covers for various purposes – outdoors/indoors, transporting, and a safety shell with adjustable visibility. Here’s a great and somewhat cheaper alternative to our pick No. 1 – Petsfit Polyester Crate Cover. Used both indoors and outdoors, this cover is both waterproof and windproof. and provides a proper insulation inside the crate. There are less variety in terms of size (3 options) and color (1 option only), however, if it fits one of your standard size crates, that shouldn’t be a drawback. If it’s the right fit, it’s really easy to put on. Although you can wash it in a machine, we would advise against it as the manufacturer hasn’t clearly stated if it’s recommended. The front flap zipper is not as durable as we’d like to, yet, the main material – durable oxford cloth – proves its worth when it comes to the overall durability. HM tip: Consider this the best price-for-value option on the market with very similar features to our top choice. If your hands are tied but you still consider the aforementioned reasons for a crate cover essential in your case, look no further than MidWest Wire Dog Crate Cover. We’re also pleased to say this comes in 6 different size options you can choose from to fit your individual crate and the fella inside. This dog kennel cover is made of durable polyester and is machine washable (and dryer-friendly). Sure, it’s not as adjustable (in terms of side windows, ventilation, and everything) as our previous top two picks, and the sound (noise) polyester makes may not be as pleasant to your ear, yet, for the price, it really holds up to the essentials of a solid dog crate cover when it comes to transporting your dog both indoors and outdoors. HM tip: Consider this a great budget option to meet the basic requirements when it comes to transporting your dog safely in a wire crate. What are the best solutions for hunting and camping purposes? This cover is the real deal when it comes to serious hunting, camping, or fishing trips – it is water-resistant and provides excellent insulation (making it significantly warmer inside than the outside temperature when closed). Additionally, it provides removable window flaps and well-designed top handles that make it easy to move around. We believe you will appreciate that the manufacturer has placed a tough and tumble rubber mesh over each window to ensure that air is dispensed properly and to secure a snug fit, and the stash pockets are also a great addition. 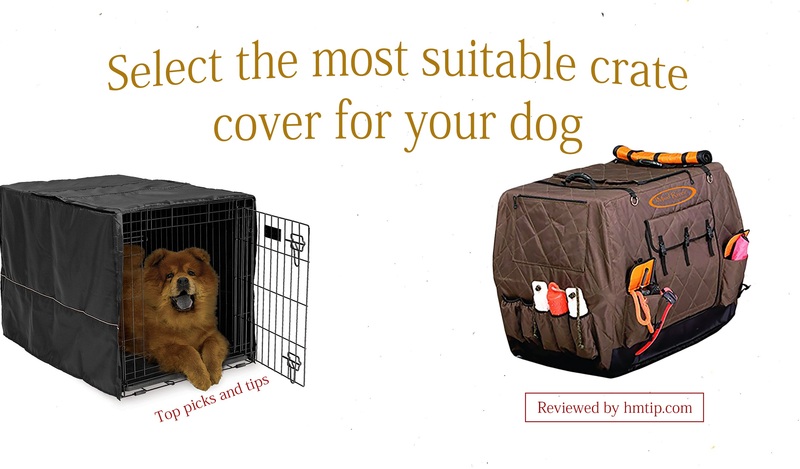 To sum this up, given its durability and many quality features, we can easily recommend this as the best solution for such activities as hunting and camping in low temperatures – the price, obviously, is noticeably higher than one for a typical crate cover, however, folks and their companions who undertake the previously mentioned activities will surely appreciate this masterpiece! HM tip: If hunting, fishing, and camping is your main thing here, we can think of no better option than Mud River Dixie Kennel Cover. Although we’ve narrowed this list of top covers for dog crates from a large number of products available on the market today to recommend you the very best in your individual case, if you’d still like to explore more options on your own, we strongly advise you consider the aforementioned criteria in this article when it comes to choosing the best option for your four-legged companion. Feel free to contact us in case of any questions, concerns, or recommendations related to any given topic of this site.